Aircraft Instruments by Consolidated Instrument, Inc. Servicing a wide range of aircraft instruments, avionics and accessories on aircraft from general aviation, regional, to large commercial fleets. Specializing in altimeters, course indicators, flight directors, gyroscopes, and tachometers to name a few. Check out our on-line database of repair capabilities! Certified FAA #QS2R120L and EASA #EASA.145.4349. Instrument Class 1, 2, 3, & 4 - Electrical, Electronic, Gyroscopic, and Mechanical Instruments, Radio Class 1, 2 and 3 limited - Communication, Navigation, and DME equipment. Accessory Class 3 and 1, 2 limited – Electronic, Mechanical and Electric components. 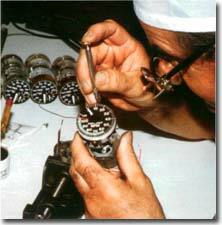 For nearly as many years as we have been servicing instruments, we have been manufacturing them as well. 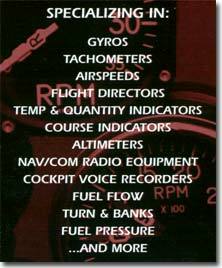 To the present, Consolidated Instruments and Avionics has produced its own line of tachometer products. Thousands of these instruments have been produced right here in Teterboro, New Jersey and have been delivered world-wide to equip a variety of aircraft, both fixed wing and rotor types. Call us today and speak with our experienced service representatives. We will supply you with all of the information you need concerning instrument repair or replacement. We look forward to assisting you. Check out any news or updates regarding recent events, personnel or announcements regarding capabilities. © 2000-2005 Consolidated Instrument, Inc. All Rights Reserved.